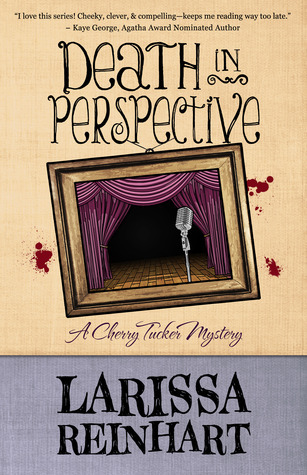 Death in Perspective is the fourth Cherry Tucker mystery and has left me rather upset . . . that I haven’t read any of Larissa Reinhart’s work before. Her characters leap to life and the plot is witty, funny, and intriguing. I can’t believe I’ve been missing out on such sassy Southern suspense! Cherry Tucker is a artist struggling to make her way from the wrong side of the tracks in Halo, Georgia into the acceptance of small town Southern society. Trouble is, she’s a Tucker, part of the Ballard clan that has a long standing Hatfield and McCoy feud with the Bransons. Complicating matters further is Cherry’s attraction to Deputy Luke Harper, a Branson by marriage if not by name. Entwined in the mystery that unfolds in Death in Perspective is the “West Side Story” romance between Cherry and Luke. Their interactions are sweet and sizzle; heck, I might have to get into the fight for Luke! While Cherry tries to sort through her seemingly impossible romantic life, she’s also trying to track down her AWOL brother Cody, track down the person responsible for sending mysterious and threatening text messages to students and staff at the posh Peerless Academy, and figure out just what in tarnation is a Tiny Tony. I adored this book and I’m chomping at the bit to get my hands on copies of the preceding three stories in the series. Larissa Reinhart has crafted a seriously engaging sleuth story with unique and true characters who are hard to forget – not that you’d want to! I’m a Midwestern girl at heart – born and raised in the dairy state – but there’s something about the South that capture my attention and my heart, in a way. Maybe it’s my inner Scarlett O’Hara, or a not-so-secret desire to swoon at someone calling me “Sugar.” Whatever the cause, Larissa Reinhart is the perfect fix for my latent Southern living longing and I’m all in from here on out! My thanks to Henery Press for the advanced reader copy of Death in Perspective in exchange for this honest review. Finally figured out where to comment! Thanks so much Jenna! I love this review so much!